Spicy cucumber pickle - a side dish you want to have with your briyani rice. Spicy cucumber pickles is a side dish, popular with briyani which is normally served on special occassion like a wedding. Other familiar condiments to be served alongside briyani rice and this spicy cooked pickle are pappadom and chicken curry. I love this pickle because the vegetables stay crunchy and the smell and the taste of them increase my appetite further to enjoy the rest of the meal. Mix cucumber, carrot, pineapple and vinegar in a bowl. Set aside for 20 mins. Strain the vinegar out, leave for one hour to dry. Heat oil in a pan, add mustard seeds, onion, garlic, candle nut and chilli paste. When fragrant, add turmeric. Stir well. Add salt and sugar, stir till the paste is thick. 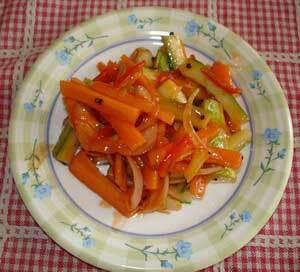 Add the marinated vegetables in step no.1. Stir. Serve hot or cold as desired.